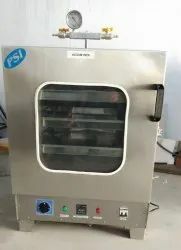 We offer a wide collection of Hot Air Oven that is offered to our customers. The inner parts of these ovens are made utilizing good quality stainless steel. We procure the raw materials from trusted vendors. Our company has specialized in the sphere of fabricating a wide range of Memmert Hot Air Oven that is sturdy in construction & durable. We used high grade raw materials that is procured from the renowned vendors of the country for the MFG. process for ensuring high efficiency of the memmert incubators. 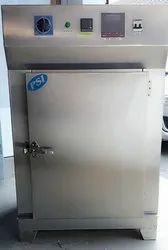 Available in different sizes, we can also customize these incubator as per the requirement of Clients. 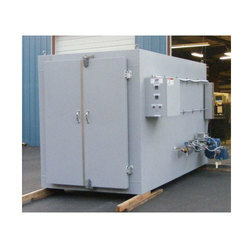 We are offering Hot Air Oven GMP Model to our Clients. 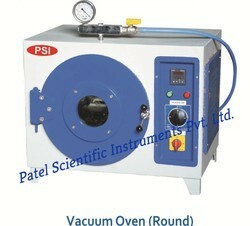 We are offering Vacuum Hot Air Oven to our clients. 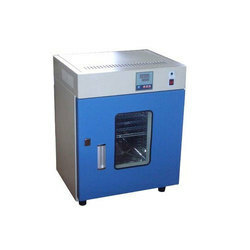 The Vacuum Hot Air Oven offered by us is widely demanded in the market due to the unmatched quality and unsurpassable performance. The unit is double walled with outer made of M. S. sheet duly powder painted and inner made of heavy gauge S.S. Sheet. 0 To 30” / 0 to 760mm of Hg Vacuum. The gap between the two walls is duly filled with high-grade glass wool in order to avoid thermal loss. Temperature range from ambient to 150°C is controlled by Digital Temperature Controller with an accuracy of 1°C, and the unit is also capable of withstanding a high vacuum. Microprocessor Auto Tune PID Controller. 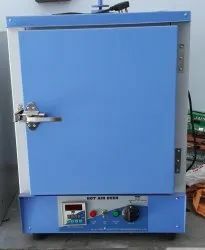 We are the reputed Manufacturer and Supplier of Digital Hot Air Oven. Digital Hot Air Ovens are elegantly designed for day to day heating, curing, dry sterilization and exposures applicable for high-temperature testing with accuracy. The Digital Hot Air Oven is durable and safe. Silicon Gasket to prevent heat loss & increase Efficiency. The Electric Hot Air Oven produced by us are widely used in aerospace, aluminum, brass, ceramics, electronics, ferrous metals, finishing, foundry, glass, motor rewinding, plastics, paint curing, powder coating, rubber, and trade heat treatment. Manual or Powered door operation. 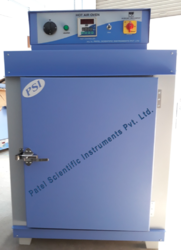 We offer wide range of Laboratory Vacuum Hot Air Oven are made from heavy gauge material & it Is rectangular in shape with full toughen glass window to view sample. Size in inches Cap in LTR No.For Shelves Rating K.W. We are offering Hot Air Ovens to our Clients.